Convert DWG to GIF. 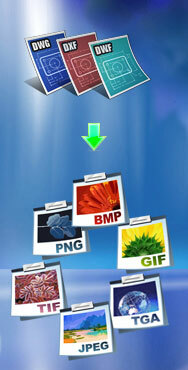 DWG Converter, DWG to GIF Converter. AutoCAD Drawing File Format to Graphics Interchange Format Conversion. User Guide for Easy CAD to PDF Image Web Version, Printer-Friendly Version, Interactive Version. · GIF (Graphics Interchange Format) is a bitmap image format that was introduced by CompuServe in 1987 and has since come into widespread usage on the World Wide Web due to its wide support and portability.